Orchestral Scoring in Studio One 2, Part 4. Reverb! Every section has its own reverb that processes it. 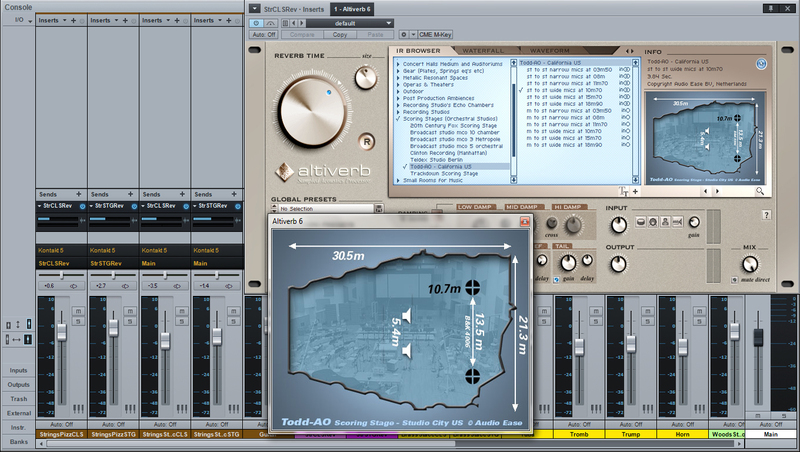 I like to use Altiverb’s IRs of stages like Todd-AO or FOX Scoring Stage. I like the fact that it has three different mic positions that were used to capture the impulse responses, so I can use them on individual close-miked sections of the orchestra. There are three IR patches of wide mic setups that I use. The closest one is for strings, the middle one is for brass and woodwinds, and the farthest one is for percussion and choir. I apply very little reverb on close mic sections just to give them air, and I apply more of it to stage mic sections to give them room. I use two instances of Lexicon. The first one is for close mic setup with a very small pre-delay and short reverb time. I use only 50% of the mix. The second instance emulates stage and far-miked setups, which requires a sizeable pre-delay and long reverb time. Its mix is set to 100%. If I have a solo vocalist in my session, I usually use any vocal plate preset for it. This covers the reverb for the orchestra. Next up we’ll look at using the Studio One Video Player for scoring. Can anybody purchase it from a bookstore? When I first saw this title Orchestral Scoring in Studio One 2, Part 4. Reverb! | PreSonus Blog on google I just whent and bookmark it. Hands down, Apple’s app store wins by a mile. It’s a huge selection of all sorts of apps vs a rather sad selection of a handful for Zune. Microsoft has plans, especially in the realm of games, but I’m not sure I’d want to bet on the future if this aspect is important to you. The iPod is a much better choice in that case. I don’t get “surgical” when it comes to applying because in the end, x number of reverbs ( like so many other people like to use) just wind up sounding washed out. I just pick a good reverb for the job at hand and apply globally. When I first saw this title Orchestral Scoring in Studio One 2, Part 4. Reverb! 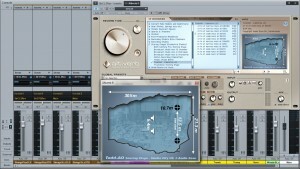 | PreSonus Blog on google I just whent and bookmark it. This is getting a bit more subjective, but I much prefer the Zune Marketplace. The interface is colorful, has more flair, and some cool features like Mixview’ that let you quickly see related albums, songs, or other users related to what you’re listening to. Clicking on one of those will center on that item, and another set of “neighbors” will come into view, allowing you to navigate around exploring by similar artists, songs, or users. Speaking of users, the Zune “Social” is also great fun, letting you find others with shared tastes and becoming friends with them. You then can listen to a playlist created based on an amalgamation of what all your friends are listening to, which is also enjoyable. Those concerned with privacy will be relieved to know you can prevent the public from seeing your personal listening habits if you so choose. When I first saw this title Orchestral Scoring in Studio One 2, Part 4. Reverb! | PreSonus Blog on google I just whent and bookmark it. You made some decent points there. I looked on the internet for the subject matter and found most guys will go along with with your site. When I first saw this title Orchestral Scoring in Studio One 2, Part 4. Reverb! | PreSonus Blog on google I just whent and bookmark it. Good post however I was wondering if you could write a litte more on this subject? I’d be very grateful if you could elaborate a little bit further. Bless you!